Phoenicia, Byblos. Azbaal, ca. 365 to 350 BC. Silver Dishekel. Size : 24.8 x 26.5 mm Weight : 13.32 grams. Reference : S-5011, SNG COP 132. Grade : XF with a good strike, nearly full ethnic, and fairly fresh die state. Obverse : Galley left with lion's head prow figure, with three hoplites holding round shields, with a hippocamp below and with a "ZO" just behind the hippocamps wing. 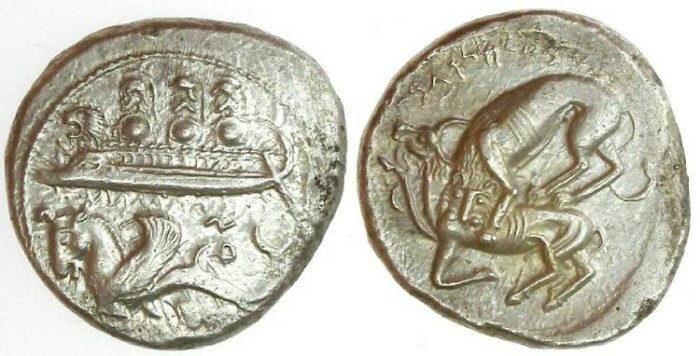 Reverse : Lion attacking a bull, with with a Phoenician inscription above, naming "Azbaal, King of Gebal".